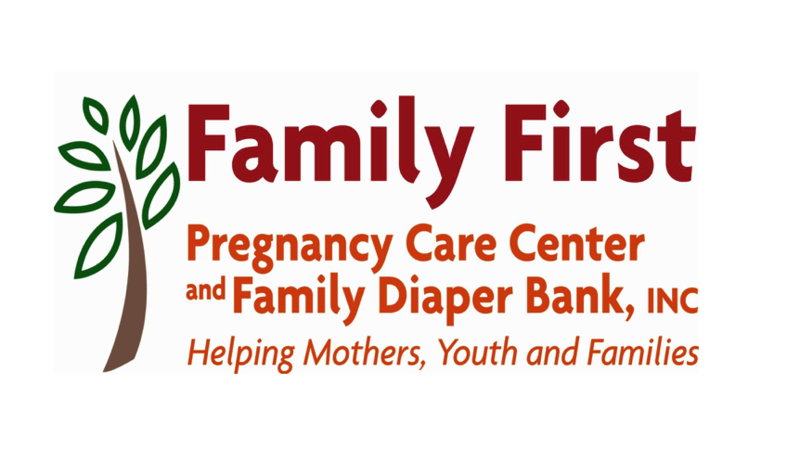 A “PERFECT” day at Family First Pregnancy Care Center would find all our clients arriving on time for their appointments, prepared to work on their lessons, and doing them in a calm distraction free environment. Their young children would all settle down to read or play quietly allowing their parents to concentrate without interruptions. All questions would be correctly answered, ‘Mommy Money’ or ‘Daddy Dollars’ would be eagerly received, the children would quickly clean up the play area, new appointments would be made, and everyone would live happily ever after. Obviously, these “PERFECT” days rarely, if ever, happen. Realizing that life is far from perfect, our goal is to provide all our services efficiently (through God’s amazing grace) with love, kindness, caring, and prayer. Most of our clients do schedule and keep their appointments to participate in the Earn While You Learn classes to earn much needed diapers, formula, blankets, clothes, and other material assistance for their families. While they concentrate on their lessons, the volunteers watch over the children amusing themselves in the play area. 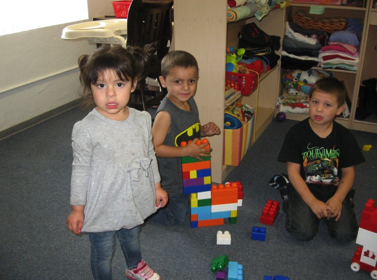 While the parents study, the children learn about sharing, playing together, and the need to clean up. This provides a wonderful opportunity for modeling parenting skills. If this were all we accomplished, it would still be a worthwhile achievement, but many days bring opportunities to go far beyond the "ordinary” activities. 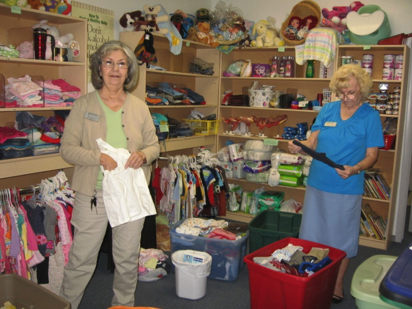 Since opening in 2004, we have frequently been able to provide help to individuals in crisis situations, by the funding that comes from grants like the Arizona Life Coalition and donations from businesses, churches and individuals that make it possible to be available to help those in need. Sometimes DPS officers or sheriff deputies have come to request car seats after accidents so children could be transported safely. A social worker came in requesting clothes, diapers, and formula for children who had been removed from an abusive situation and were being temporarily placed with an elderly relative who did not have things for the children. Last week a grandmother came into our center to ask if we ever helped young families with diapers, clothes, and formula. She seemed embarrassed and explained that she and her husband had been the victim of identity theft and their bank accounts had been drained. They were in the process of trying to get their funds restored. She told us that her son-in-law had been laid off and had not been able to find a job. Her daughter, a new mother, was now the only one currently employed. She would get her next pay check in two weeks but they had no money to buy formula or diapers until then. The grandmother said, “I volunteer at the local food bank. Normally, my husband and I would help them, but we don’t have money right now. I never thought I would ever have to ask for help. It is a humbling experience.” After encouraging her, we were able to pray with the woman and provide her with diapers and formula. At the Winkelman center, a young woman showed up one afternoon. On the night before, she had grabbed her two young children, loaded them into her car, and fled from an abusive relationship. She was trying to reach her family about 90 miles away. Halfway there, her car ran out of gas, and they were parked in a small campground by the river. The weather had turned very cold. She didn’t have money for gas; her children were cold and hungry. Someone in town told her to go to Family First, because they cared and would try to help her. 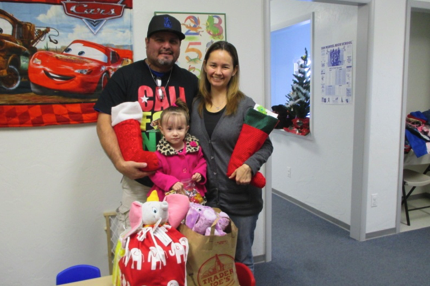 After learning about her situation, the center gave her warmer clothes and blankets. The director contacted a local business that provided a large box of groceries and bought her a tank of gas. The next morning, after prayer and warm hugs, the family was back on the road heading to a safer place. Family First is excited and happy that it is able to provide assistance to both our regular clients and to those who need that extra help in crisis situations. We are eternally grateful to God and to all those who contribute and allow us to give to others.